How to motivate more bookings from social media? You have a passion and this passion has led you to build your school. Like you, there are thousands of people who share this passion or, at least, an interest in these activities. So do not lose the opportunity to share with them what you like, what you feel, what you find ... let them interact and engage in conversation. You will meet many people who think the same as you, others who have a different opinion or are full of doubts. The important thing is to open a continuous dialogue on your Facebook page so that, more than a social network, one feels like among friends or acquaintances. Perhaps you have already used these ads without getting the expected result. Depending on the country where you are, your target audience, interest, industry... it is possible to get quite different results. But we will give you some tips to take advantage of this very interesting tool offered by Facebook. Imagine being able to show ads to people who have already visited your website, or visited Facebook pages from the sector… or who have performed an action particularly relevant to you offer? Through the ads of Facebook it is now possible! This is what we call "retargeting": the possibility of addressing personalized audiences from past behavior. Go to the Ad Manager and select Tools > Pixels. Click "Create Pixel" and name it. Retrieve the 'pixel' code to insert in your web page between <head> and </ head> (if this seems too complicated, leave it to your webmaster while you focus on what’s going on on the beach! Return to Ad Manager and select Tools > Create > Create Conversion. Choose the "Custom Conversion Tracking" method. Set up the rules that will trigger your pixel and conversion category. Go back to the Ad Manager and select Tools > Public > Create Pixels. Define your audience and click on "Create an audience". With these three simple steps we can start creating Facebook ads targeted to users who have previously been on our website or who have shown an interest in the activities we offer. We recommend you to have a look at the 'Facebook Ads Guide' in case you have never used it. 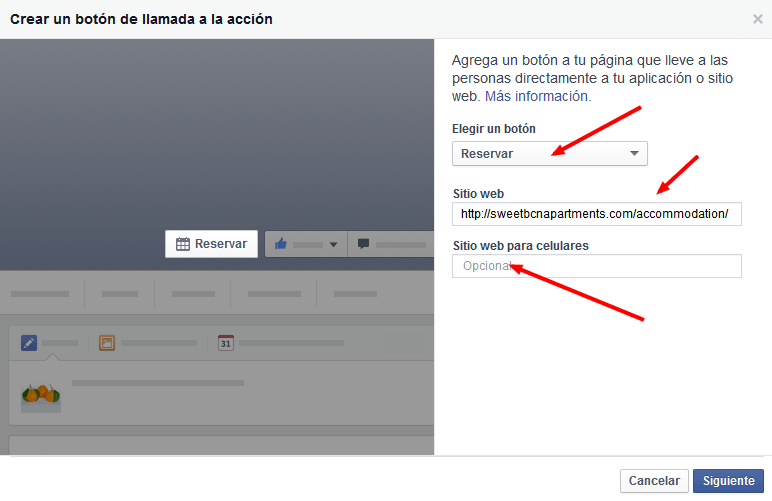 For some time, Facebook has included a "Call To Action" (CTA) button from the Facebook page to attract the attention of our customers. From this "Call to Action" button we can select the tab "Book". With the button labeled "Book” we'll see a message saying, "Create a Call to Action". Click on it and choose the type of Call To Action you want. If your choice is "Book" you will be asked to enter the URL of the landing page or website you want, both accessible from computers and mobile. In case you do not have a booking system, we recommend that you have a look at the Bloowatch solution that may prove useful to you and your customers. Follow 3 three simple tips and you will get the most out of Facebook, your customers will notice it and this will be reflected in your sales. But you will need to show commitment before reaping the fruits of this work, and keep in mind to always reflect that this work is inspired by your passion.